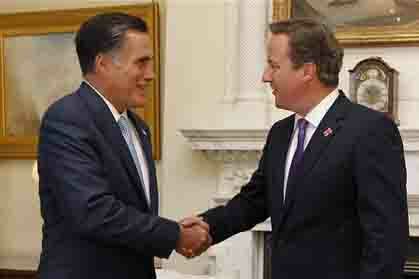 U.S. Republican Presidential candidate Mitt Romney meets with British Prime Minister David Cameron in London. A political gaffe these days is when a politician tells the truth. Mitt Romney has shipped lots of criticism about his various comments in London while there for the Olympics. Democrats have tried to portray him as Sarah Palinesque in his inability to articulate and get basic facts wrong, but when you examine what he said was it all that bad? Firstly his comments on British preparations for the Olympics were spot on. He was asked about Britain’s preparations for the Olympics and instead of waffling about how great they were, he pointed up some concerns. "There are a few things that were disconcerting," Romney said. "The stories about the private security firm not having enough people, the supposed strike of the immigration and customs officials – that obviously is not something which is encouraging." What could be wrong with that? A politician tells the truth and he was, of course, immediately slammed for it. David Cameron huffed and puffed on Thursday. "We are holding an Olympic Games in one of the busiest, most active, bustling cities anywhere in the world,"
Also true but Romney was correct that there was a major security faux pas. Again a very minor point. That is what he would have been called in America and Miliband’s title is leader of the opposition. British journalists sneered that Romney had forgotten his name but there is no compelling evidence of that. His actual statement was "Like you, Mr Leader, I look forward to our conversations this morning," Romney said. Next he was accused of publicizing the fact that he met the MI6 leader. Britain loves their spooks, and the media, now in full hue and cry demanded that Romney should have kept the information secret. Whatever for? If Romney met the head of the CIA and the Secret Service no one would think anything of it. Again score one for Romney and not the hysterical British. This is what Romney said: "I appreciated the insights and perspectives of the leaders of the government here and the opposition here as well as the head of MI6"
Hardly the stuff of espionage thrillers. Finally, advisors to Romney not Romney himself referred to “common Anglo Saxon heritage.” Romney got tagged with their language which many saw as a not too subtle racist slap at Obama. The unnamed advisors back pedalled but it was hardly Romney’s fault they spoke so stupidly. Again, much ado about nothing. Score yet another knickers in a twist moment for the Brits and a clear indication that Obama still has the hearts and undying devotion of overseas journalists.